Sooner or later, it was bound to happen. A rogue scientist in China claims to have edited a gene in two human embryos and implanted them in the mother's womb, resulting in the birth of genetically altered twin girls. We're no longer in the realm of science fiction. This hacking of their biological operating instructions, which they will pass on to their children and generations to come, is a dangerous breach of medical ethics and responsible research, and must be condemned. This is not to say that medicine won't some day employ gene-editing technologies in similar ways. But that time has not arrived. There are still too many risks, too many unknowns, about tinkering with our heritable genetic blueprints. In recent years, genome editing has been appropriately heralded as the most important advance of biotechnology of our generation, and most likely the past century. Commonly known as Crispr, this technique and related DNA-editing tools enable their users to cut and paste discrete letters of the genome. This capability has markedly advanced science, shedding new light on the complex human genome with its billions of A, C, T and G letters that are the architecture of who we are. Already, many clinical trials using this technology are under way, involving patients with rare diseases such as haemophilia, thalassaemia and sickle cell. The difference between these efforts and what reportedly happened in China is that these genome-editing trials involve cells from the patient's body. The manipulations are not transmissible to the next generation. These trials are in their early stages, and we do not yet have results to show whether this type of editing is safe or provides effective treatment. But, whatever happens, the consequences are confined to the patient, who has consented to the experimental treatment. While there have been reports of human embryo-editing experiments in laboratory Petri dishes, until now, so far as we know, none of these embryos has been implanted in humans. Here, the hazards become markedly amplified because the editing intervenes in so-called germ line cells that are transmitted from one generation to another. Conceivably, every cell in the body, some 37 trillion, could be programmed with the edits. In the Chinese study, led by Professor He Jiankui, a physicist, not a medical doctor, on the faculty of Southern University of Science and Technology in Shenzhen, the targeted gene was CCR5, which helps enable HIV to enter cells. While preventing this intrusion might sound like an advance in the fight against Aids, it is completely unnecessary and may even carry the hazard of increasing the subject's susceptibility to other types of infection, such as influenza and West Nile fever. Previous genome-editing studies have shown it is possible to disable the CCR5 gene in adults without working at the embryo level. So, the experiment was not necessary, had no scientific basis and must be considered unethical when balanced against the known and unknown risks. The predominant risks are the potential impacts of the editing on other letters of the genome, which could induce diseases later in life even if they aren't present at birth. Although the technology is promising, we do not have the assurance that Crispr provides laser-like precision in editing. We know, for example, that certain important genes for suppressing cancer are particularly susceptible to unintended editing. The way we assess this risk is to sequence the genome before and after editing, to see whether changes were made in genes other than the target gene. But our ability to discern these changes is still rudimentary, and it is entirely likely that we will miss something. The fact that we may not have seen unintended mutations brought about by editing is by no means proof of their absence. With six billion letters in the genome that could be affected, the risk of unintended, "off target" editing is considerable and requires extensive scrutiny to understand and mitigate. That's partly why editing the genes of human embryos is prohibited in the United States and banned in many European countries. Even beyond the actual editing, this episode appears to have been marked by breaches of scientific conduct. One issue is informed consent. It is unclear whether the parents were told that there were simple ways to protect the embryos from Aids that might have been transmitted by the HIV-infected father. Given that, why would they consent to this risk procedure? Moreover, no report by the researchers has been produced for the biomedical community to review. Through a journalist reporting about this, I had the opportunity to see some of the data, and there's little question that Prof He at least attempted to edit the genomes of the embryos. But no sequencing data has been presented or independently assessed. Neither has data been released to show whether the targeted gene was functionally disabled, which would require cell experiments. Science demands such transparency, but all we have is a YouTube video by the researcher, who makes the bold claim that "the gene surgery was safe". Prof He's university has disavowed knowledge or support of the research and said an investigation is under way. It said his "conduct in utilising Crispr/Cas9 to edit human embryos has seriously violated academic ethics and codes of conduct". 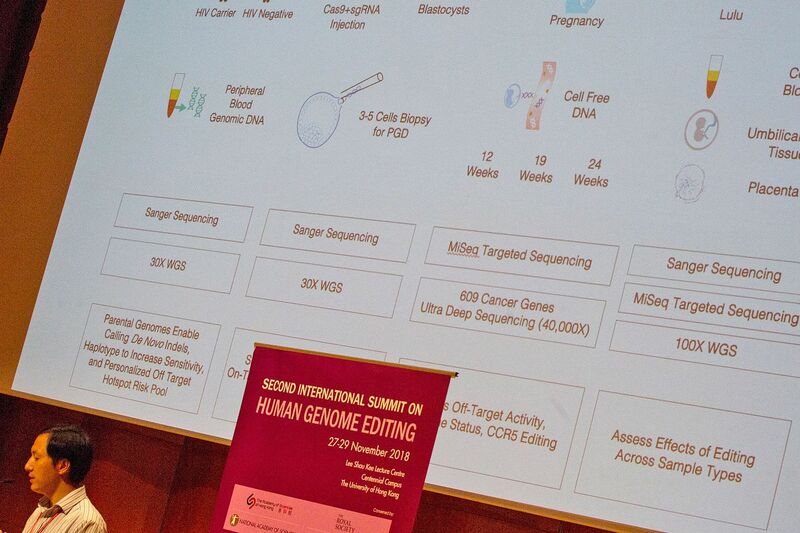 It is difficult to envision a foolproof way to rein in such rogue efforts, notwithstanding the international consensus that we are still nowhere near ready for genome-edited babies. Certainly, scientists like Prof He should be castigated by their institutions and the biomedical community, as he was in this case, and perhaps that will discourage this sort of unethical research. Governments should also condemn these practices and impose significant penalties, like pulling research funding and making these scientists ineligible for more. At this point, we do not know whether the intended human genome editing was achieved in the twins and have no idea whether it will prove to be safe if it was accomplished. But we can conclude that this was a misguided, reckless demonstration of using powerful gene-altering tools to create edited human beings. We should not proceed down this road until we know far more about the consequences of what we are doing. • Eric J. Topol is a cardiologist and director and founder of the Scripps Research Translational Institute, which focuses on providing individualised medical care using human genomics and digital technologies.